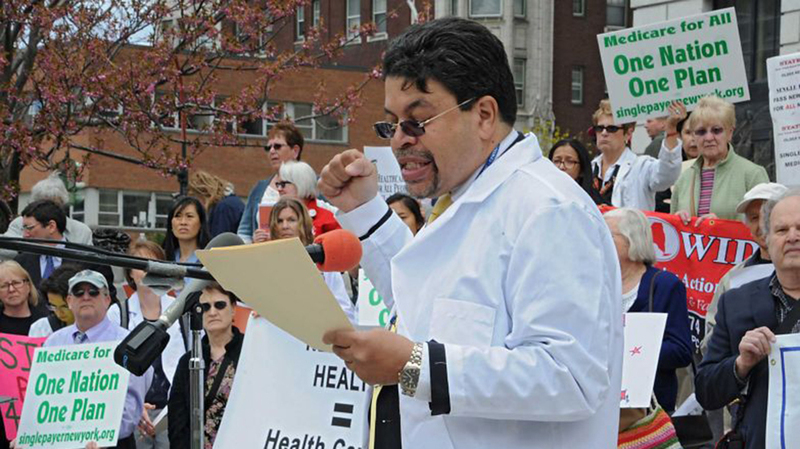 On May 7, 2014, hundreds of doctors, nurses and patients rallied outside the New York State Capitol in Albany and shared stories about their experiences of our health care system in crisis. Advocates then attended more than 80 lobby meetings to push for more cosponsors for the New York Health bill, which if passed, would create a publicly financed, privately delivered health care system in New York State that saves lives and money. The rally attendees also asked legislators to urge Assembly Speaker Sheldon Silver to allow a vote on the bill. The bill currently has close to majority cosponsorship in the Assembly and the endorsement of a wide coalition of organizations including New York State United Teachers, SEIU 32 BJ, Citizen Action of New York, Public Health Association of New York City, 1199SEIU, the New York State Nurses Association, and the Working Families Party. Click play below to view a short video of Doctors Council Executive Director Dr. Matthews Hurley speaking at the rally.